The latest RPG from the developer of the Risen series. CD Projekt and BioWare have them roundly beaten when it comes to story and characters, but I do have a soft spot for Piranha Bytes' moderately shonky RPGs, which tend to be pretty great at exploration. Following on from the Gothic games, and the increasingly piratey Risen series, is the upcoming Elex, which mashes up fantasy with science fiction and the post-apocalypse. Oh, and there are jetpacks, because jetpacks are most definitely in this year. 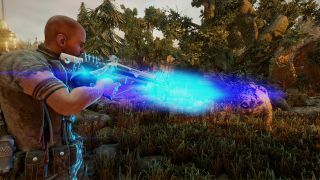 There are loads of videos floating around of Elex on YouTube, including an appearance at this year's PC Gamer Weekender, so you can see for yourself how it compares to Piranha Bytes' other games. If you like what you see, then you might be interested in the release date, which has just been announced as...October 17. Smartly, that's not too close to the traditional November rush. I can't find a recent trailer with any game footage in it, so here's today's 'official CGI trailer', which shows the grimly bald protagonist strutting about to some middle-of-the-road rock music.